Srila Bhakti Dayita Madhava Goswami Maharaj “All service to your Gurudeva is hundred percent yours. 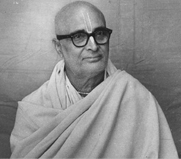 You are to be grateful to whosoever is helping you in that,” this was Srila Prabhupad Bhakti Siddhanta Saraswati Thakur’s instruction to one of his most favourite disciples, His Divine Grace Om Vishnupad Ashtottrashat Sri Srimat Bhakti Dayita Madhav Goswami Maharaj (Srila Gurudeva), who appeared in this world on November 18, 1904 A.D. (on Utthan-Ekadashi tithi) at Kanchanpara dham (District Faridpur, now in Bangladesh). 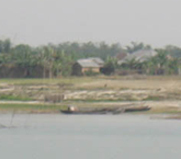 The Holy Birthplace of Srimad Madhav Goswami Maharaj is situated at the bank of the Padma River, which is near Premtoli where Srila Narottama Thakur experienced ecstatic feelings of Divine Love while bathing as per the direction given by Srimad Nityananda Prabhu in a dream. Sri Gauranga Mahaprabhu kept Divine Love in the custody of Padmavati Devi (the Presiding Deity of the Padma River) to offer it to Narottama Thakur when he would come there to take bath. He went with friends to Sri Mayapur, the Holy Birth-Place of Lord Sri Chaitanya Mahaprabhu, and met His Gurudeva, His Divine Grace Srimad Bhakti Siddhanta Saraswati Goswami Prabhupada at Sri Chaitanya Math in the year 1925 AD. He was attracted to Him upon seeing His Divine Spiritual Personality. 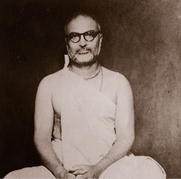 Taking absolute shelter at His Lotus Feet, He took initiation from Him at Sri Gaudiya Math, at 1, Ultadanga Junction Road, Calcutta on November 1, 1927 AD. 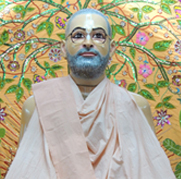 He joined the Sri Gaudiya Math Institution immediately after taking initiation and also made His devout vow of celibacy, even though young of age. Within a very short time, He was regarded as one of the favorite disciples among the entourage of Srimad Bhakti Siddhanta Saraswati Goswami Prabhupada. 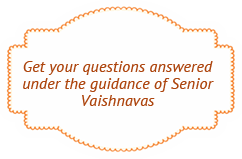 This was due to His devout devotion to Guru, His competence in rendering all kinds of service, and His untiring enthusiasm and diligence to serve Vishnu and the Vaishnavas. Srila Bhakti Siddhanta Saraswati Goswami Prabhupada, seeing His undaunted spirit to contribute to the objective of the Institution by way of practicing and propagating the Gospel of Divine Love of Lord Chaitanya Mahaprabhu, used to commend Him by saying, “His energy is volcanic energy”. Srimad Bhakti Siddhanta Saraswati Goswami Prabhupada never hesitated to send Him to perform any important task or to send Him out as an advance party because He was confident and sure that the task at hand would be successfully completed in due course. 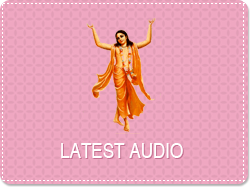 He actively helped in organising preaching festivals as well as Parikramas of Vraja and Navadwip Dham, establishing preaching centres and the Maths, spreading the message of Sri Chaitanya Mahaprabhu in the cities and villages. 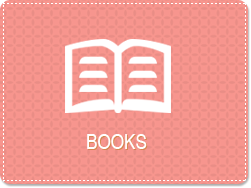 He also established shrines of Mahaprabhu’s Lotus feet (Pada-pithas) in many of the places the Lord had visited, restored other holy sites, published transcendental books and magazines in order to spread the message of pure devotion. 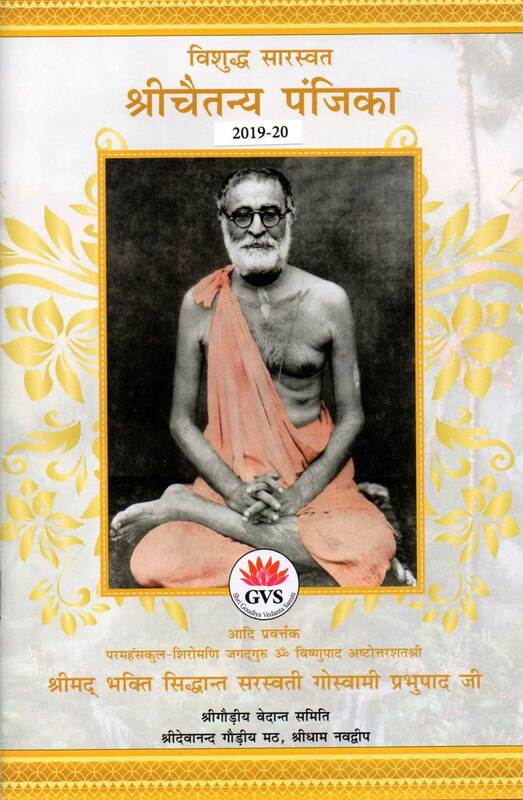 Srila Bhakti Siddhanta Saraswati Goswami Prabhupada had so much confidence in Srimad Hayagriva Das Brahmachari (Madhav Goswami Maharaj), that He first selected Him to be sent to foreign countries for preaching, for which purpose His Passport and all necessities were ready. But Rajarshi Sri Saradindu Narayan Ray, one important household devotee, objected to this proposal saying that Sri Hayagriva Das pahmachari was young and very beautiful, “There may be difficulty in sending such a beautiful, young pahmachari to foreign countries. Instead an old Sannyasi should be sent there.” At his suggestion, Param Pujyapad Srimad Bhakti Pradeep Tirtha Maharaj was sent instead. Srimad Hayagriva Das Brahmachari resembled His Divine Grace Bhakti Siddhanta Saraswati Goswami Prabhupada in appearance so much, that many outside people wrongly thought Him to be the son of Srimad Bhakti Siddhanta Saraswati Goswami. I make prostrated obeisances repeatedly to the Lotus Feet of Revered Gurudeva His Divine Grace Om Vishnupad Shreemat Bhakti Dayita Madhav Goswami Who is dear to the devoted entourage of Rupa Goswami, Embodiment of non-distinct Manifestation of Sree Krishna, gracious to the wretched, Incarnation of Forgiveness and who by showing the example of Love of Gurudeva by serving His god-brothers and revealing the glories of Ishodyan, immensely increases the joy of the hearts of His god-brothers by His conspicious glorious deed of recovering the Holy Birthsite of Sreela Saraswati Goswami Prabhupad* at Sree Kshetra (Puri). No Video Conference Scheduled at the Moment!